Percy enlisted on 3rd October 1915. He was 28 years old; was a horsekeeper by trade and was living at 7 Pudding Lane, Maidstone, Kent at the time. He was posted to "T" Coy on the 12th, then was transferred on the 28th to serve with the 133rd Field Ambulance. On 5th March 1916 he embarked at Southampton, then disembarking at Havre the next day he entered the war in France on 6th March 1916. On the 7th August the Germans started shelling Bethune, wounding nurses serving with the 33rd CCS and civilians, who went into a panic. Percy was serving with a stretcher squad orginised to assist in the clearing of the wounded from the streets, and was severely wounded in the Belfry Square. 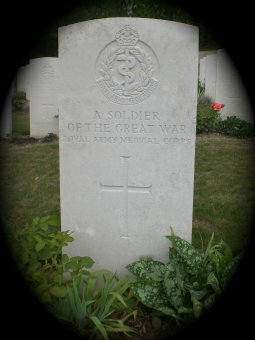 He died from his wounds in No 1 Casualty Clearing Station. A party of his comrades attended his funeral. Percy was the Nephew of Frank Brown of the same address as above.